Located off historic Highway 49, Columbia was one of hundreds of small enclaves that cropped up in the Mother Lode region during the Gold Rush of the early 1850s. Columbia was founded in 1850 by Dr. Thaddeus Hildreth, who found placer gold in the area. The spot became known as Hildreth's Diggings, then later was called American Camp, before becoming Columbia. During its productive mining years, roughly 1850 to 1870, the area mines produced more than $87 million in gold, making it one of the richest gold strikes in the state. Like most western mining towns, Columbia was originally a tent city—within a month of the discovery of gold it boasted 5,000 residents. By the mid-1850s, Columbia had more than 15,000 residents and was the largest town in the gold country's southern mining region. Just as Virginia City nearly burned to the ground in 1875, Columbia had its share of disastrous fires in its early years. In 1857, following the second fire in three years, Columbia was again rebuilt of brick and stone with wrought-iron doors and window shutters to prevent future fires. Columbia began to decline after its mines ceased to produce in the 1870s. Within a few decades, the empty buildings outnumbered those in use. Also like Virginia City, Columbia was never completely abandoned and over the years claimed at least a handful of residents. Fortunately for Columbia, the California state park system acquired the crumbling town in 1945 and began to restore many of its buildings. Today, you can walk its hard-packed dirt streets, wander by more than three dozen restored and renovated historic structures and get a true feeling for life in the mid-19th century. The state park system has peopled Columbia with the kind of businesses you would likely find in an 1860s town. There are saloons serving beer, a working blacksmith shop, the oldest barbershop in California, stagecoach rides and a photography studio offering old-fashioned sepia-tone photos. During the summer months, the restored Fallon House Theater (originally the Fallon Hotel), built in 1860 offers plays performed by the visiting repertory company. The town has a rich theatrical history with many famous frontier-era performers having appeared there, including Lola Montez and Lotta Crabtree. Perhaps the oldest and most famous building in Columbia is the 1858 Wells Fargo Express Building, a two-story brick structure that features the classic iron shutters and lacework balcony so prominent in Columbia's architecture. Inside, you can find the offices have been restored with authentic period furniture including the huge gold scales that history tells us measured some $55 million in gold dust. Additionally, you can find an excellent museum describing the area's past and a schoolhouse, built in 1861, that was one of the state's first public schools. The museum features informative displays describing the town history and showing how various buildings have been restored. The school has been faithfully restored with desks, seats, a pump organ and period books. Other interesting historic sites include D.O. Mills Bank Building, built in 1854; the Cheap Cash Store, built in 1854, and the Livery Stable, which houses several old-time wagons. Stagecoach rides are offered from the front of the Wells Fargo Office. For a nominal price, you can take a 15-minute ride through the town. In addition to the town, visitors can also tour the 1855 Columbia cemetery, located behind the schoolhouse, or wander along a one-mile nature trail, which starts at the schoolhouse. Columbia is located about three-and-a-half hours west of Fallon via U.S. Highway 50, Highway 49 and Parrotts Ferry Road. For more information contact Columbia State Historic Park, 209-588-9128, or go to www.parks.ca.gov. A dark-haired woman, perhaps in her early 30s, strolls through the glass and bronze double doors of the majestic Washoe County Courthouse. She pauses next to one of the massive columns that support the courthouse’s portico and then leans over to plant a kiss on the pillar. She heads north toward the Riverside Hotel, where she had spent the previous six weeks dreaming of the moment she would finally be free. She pulls off her wedding ring and then throws it as hard as she can into the river. She is about to begin her new life. Or at least that’s how it happened in the famous Reno legends. Fortunately, a handful of places still remain in Reno with ties to that period. 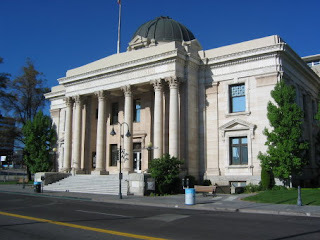 The most obvious symbol of a Reno divorce is the Washoe County Courthouse, where so many divorces were granted and on whose pillars so many kisses were allegedly planted. The courthouse, completed in 1911, was designed by famed Nevada architect Frederick J. DeLongchamps in a Classical Revival style. Another longtime divorce industry landmark is the Riverside Hotel, erected in 1927 by Reno powerbroker George Wingfield. Built with wealthy divorce-seekers in mind, it had 40 corner suites with refrigerators, kitchens and connecting rooms for children and servants (it also had 60 smaller, single rooms for guests of more modest means). • The El Cortez Hotel (239 W. Second St.), which opened in 1931. Designed by the Reno firm of George Ferris and Son, it was the tallest building in the city when it was completed. It quickly became a popular place for divorce-seekers to stay; business was so good that it was expanded a year after it opened. • The Nystrom House (333 Ralston) was a Gothic Revival style home built in 1875 for Washoe County Clerk John Shoemaker. It served in the 1920s as a boardinghouse for Reno’s divorce trade. • The Glass Gallery/Dow House (935 Jones Street) was built in 1907-08 by Lisle Jamison. By the early 1930s, the lovely Colonial Revival/Queen Anne style home had become a popular rooming house for divorce seekers. • The Twaddle Mansion (485 W. Fifth Street) was built in 1905 for local rancher Ebenezer “Eben” Twaddle. The elegant house boasts fluted posts with Ionic caps, which support a frieze and pediment. Starting in the early 1930s, it, too, became housing for divorce-seekers. Additionally, in the 1930s a thriving “Dude Ranch” business bloomed in rustic areas around Reno, including Washoe Valley’s famous Flying M E Ranch and the Pyramid Lake Ranch. While many had private cabins for divorcees (60 to 70 percent of which were women) waiting out their six weeks, others consisted of large ranch houses with dining rooms and living quarters shared by guests. Closer to Reno, the Frey Ranch (1140 West Peckham Lane) was built in 1870 by Enoch Morrill and, after it was sold in the 1890s, was owned by Joseph Frey and his family. In the 1920s and 30s, the ranch, which includes a Folk Victorian main house, was used as a dude ranch for divorcees seeking the “Reno cure” (as a divorce was called in those days). Reno’s divorce trade peaked in 1946, when 19,000 divorces were granted. 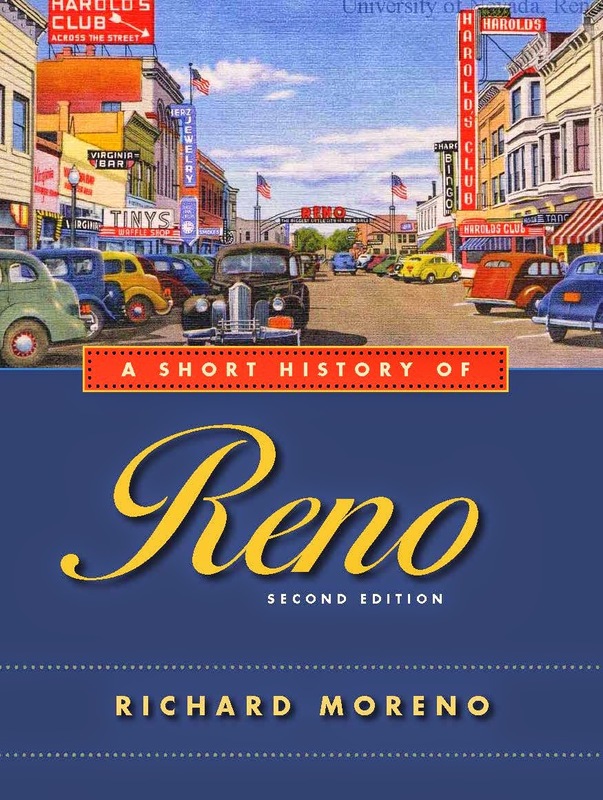 By the 1960s, Reno was no longer America’s divorce capital, having been eclipsed by much larger Las Vegas, and ultimately done in by looser divorce requirements in many other states. Still, it was a good ride while it lasted.